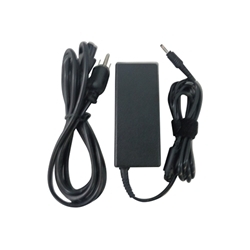 Description: New 60 watt high quality aftermarket laptop ac adapter charger and power cord. Output: 19V - 3.16A. Compatible Part #'s: ADP-60ZH D, ADP-60ZH A, AD-6019, AD-6019A, AD-6019R, AD-6019S, AD-6519, NP-R519, SPA-830e, CPA09-004A, PSCV600/04A, CPA09-004A. Samsung Sens 500, 630, 640, 650, 670, 680, 690, 700, 710, 750, 800, 810, 820, 850, 855, 860, 870, 890. Samsung X05, X06, X10, X11, X15. Samsung Sens Pro 640, 680, 850. Samsung Q1, Q30, Q35, Q40, Q43, Q45, Q68, Q70. Samsung Q1U-El, Q1U-V, Q1U-ELXP, Q1U-XP, Q1U-SSDXP, Q1U-CMXP, Q1PSSD. Samsung GT6000, GT6330, GT6330XT, GT6360, GT6360XT, GT6400, GT6400XV. Samsung GT7000, GT7700, GT8000, GT8600, GT8600XT, GT8650, GT8650XT, GT8700, GT8700XT, GT8750, GT8750XT, GT8750XV, GT8800, GT8800XT, GT8800XV, GT8850, GT8850XT, GT8850XTD, GT8900, GT8900DXV, GT8900XTR, GT8910, GT8910KXV, GT9000, GT9000, GT9000 PRO. Samsung VM6000, VM6300, VM6300CT, VM7000, VM7550, VM7550CT, VM7650, VM7650CT, VM7650CXTD, VM7600, VM7600CT, VM7700, VM7700XTD, VM8000, VM8000, VM8080, VM8080CXT, VM8090, VM8090CT, VM8090CXTD, VM8100, VM8100CX, VM8100CXTD, VM8110CXTD, VM8110XTC. Samsung P27, P28, P29, P30, P35, P40. Samsung R19, R20, R23, R25, R40, R45, R50, R510, R60, R710.